From PITTSBURGH and Points West: Take I-76/I-376 East to U.S. 22 East. Drive on 22 East for approximately 80 miles. Merge onto I-99/US-220 North approximately six miles from Altoona. Stay on I-99 North and take the Frankstown Road exit. Go straight at the light at the top of the ramp (crossing over Frankstown Road). The ballpark is on the right. From STATE COLLEGE and Points North: Take U.S. 322 West to I-99/U.S. 220 South. Take Frankstown Road exit. At the top of the ramp, turn right at the light onto Frankstown Road. Take a right at the next light onto Park Avenue. Ballpark is on the right. From BEDFORD, PA/CUMBERLAND, MD and Points South: Take I-99/U.S. 220 North toward Altoona. Take the Frankstown Road exit. Go straight at the light at the top of the ramp (crossing over Frankstown Road). The ballpark is on the right. From HARRISBURG/PHILADELPHIA and Points East: Take Pennsylvania Turnpike West to Bedford exit. Following the toll booths, take a left at the light. Follow signs and get on I-99/U.S. 220 North. Take Frankstown Road exit. Go straight at the light at the top of the ramp (crossing over Frankstown Road). The ballpark is on the right. From I-80 Traveling East: Take the Philipsburg/Woodland Exit to U.S. 322 East. After about 25 miles, take U.S. 220 South. 220 South merges with I-99 South. Drive on I-99 South for approximately 20 miles. Take the Frankstown Road exit. Turn right at the exit, the ballpark will be to your right. From I-80 Traveling West: Take the Altoona/Milesburg exit and bear onto U.S. 220 South. After approximately 30 miles merge onto I-99 South. Drive on I-99 South for approximately 20 miles. Take the Frankstown Road exit. Turn right at the exit, the ballpark will be to your right. If you need specific driving directions to Peoples Natural Gas Field, please send an e-mail to frontoffice@altoonacurve.com at least 48 hours prior to your trip or call us at 877-99-CURVE. There are two parking areas at Peoples Natural Gas Field. The parking lot directly in front of the stadium is reserved for VIP/Season Ticket holders and people who require special assistance. All other fans can park in the parking garage located beyond left field on Park Ave. for $3 per game. Red VIP Lot: Reserved for Season Ticket Holders with a red parking pass, distributed before the start of the season. 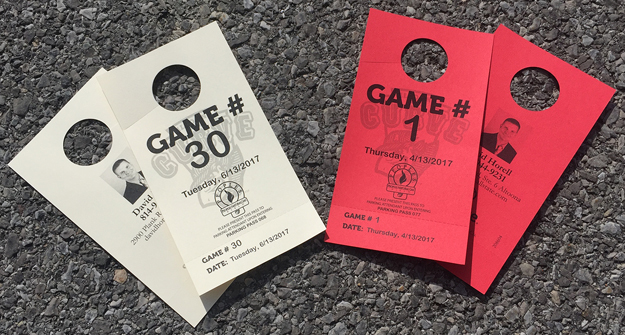 No single-game individual parking passes are available for the Red Lot. Tan VIP Lot: Reserved for Season Ticket Holders with a tan parking pass, suite holders and individual fans on a limited basis (until Tan Lot passes are no longer available, on a game-by-game basis). Individual parking passes are $4 each. When all Tan Lot passes have been sold, additional parking is available for $3 in the parking garage between PNG Field and Lakemont Park. Parking Garage: There are three levels of parking for fans in the Park Ave. garage conveniently adjacent to PNG Field for $3. Cart service is available for fans who may need it, running one hour before first pitch to 30 minutes following the game.